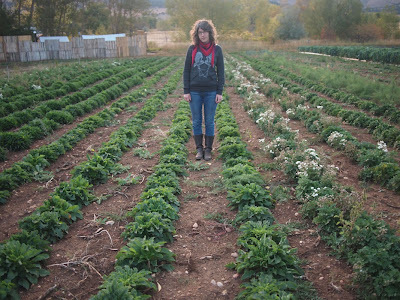 Our recent CSA harvest party was an evening filled with campfires, wine, delicious farm food and cool fall weather. The perfect opportunity to bring out the my newest handknits! 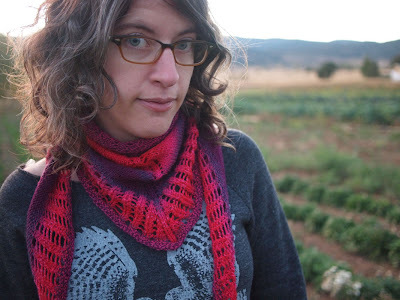 This sweet little plum shawl is the Damson, a Ysolda Teague pattern that practically flew off my needles as I was antsy to get it finished for my Iceland trip. I loved working with this self-striping indigo and magenta colorway--which is actually quite subdued as Zauberball goes! 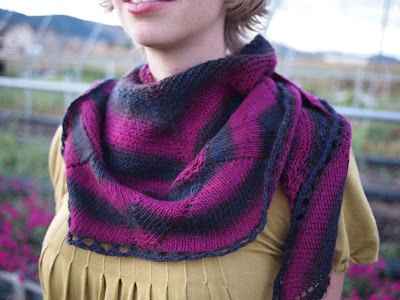 The scalloped lace bind-off was a treat at the end! Joelle Hoverson's new book, More Last Minute Knitted Gifts is just as adorable as her previous books. 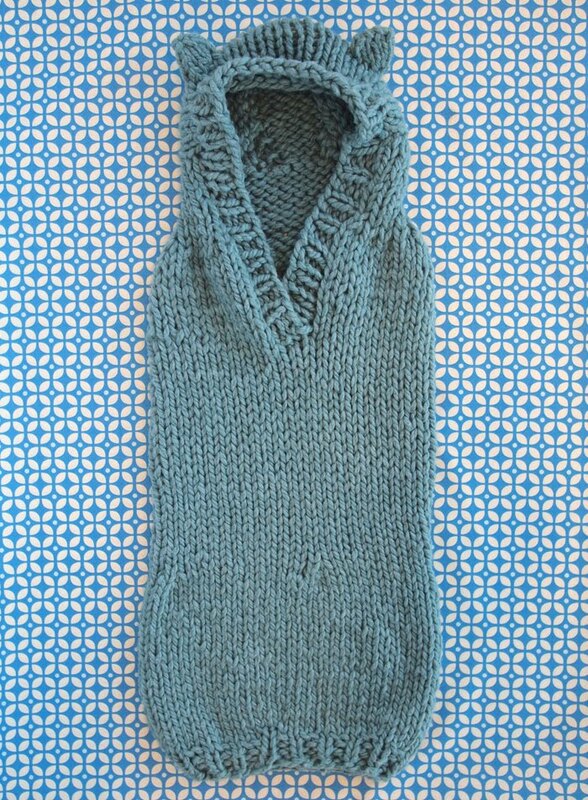 I couldn't get my mind off of a certain pattern, the Easy Baby Cardigan--which unfortunately is an infant pattern. Here is my "me-sized" take on it. I knit it up in Cascade Baby Alpaca Chunky and it is insanely warm and cozy. Eddie, my handsome husband, was recently the recipient of a handsome brown Daybreak. 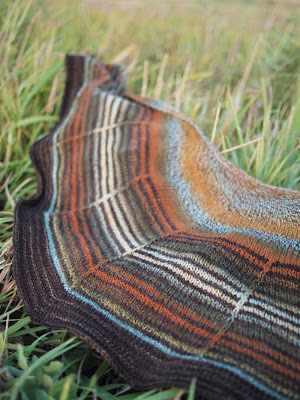 This rare item of gift knitting was knit in Malabrigo Sock striped with Zauberball Sock. It is a pattern which I could knit again and again. And can you handle how awesome his reverse appliqued keyboard hoodie is? Emily whipped that up at a craft night recently. As you can see, we are totally into little shawls these days. 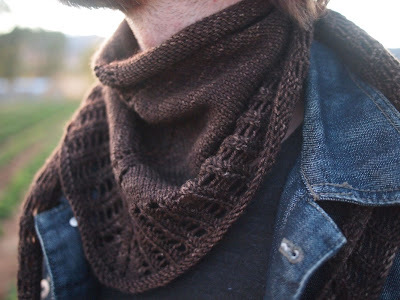 The size and shape are perfect for keeping your neck and open collar warm, and they can use much less yarn than a long scarf. 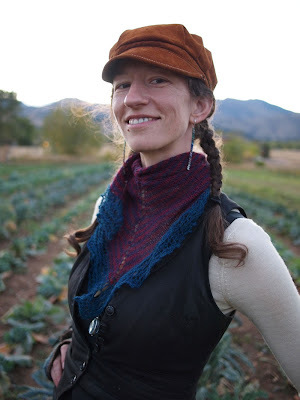 They can be simple or insanely intricate, and there are so many great patterns for beginners or more advanced knitters. This little shawl is based on the 45-45-90 triangle. This is a very special triangle in Euclidean geometry... but maybe we'll just say it's really pretty. I have knitted it twice so far, and am already trying to pick out my next colors. The pattern is a simple one that I made up, and doesn't require much attention or stitch markers. For this one, I used three colors of Cascade Alpaca Lace and 5mm/US8 needles, and it knits up pretty fast for laceweight. The edging was really fun too! The name Catheti refers to the two legs of a right triangle. In this version, I added a lacy edging. This has become one of my most reached for knitted pieces, and I can't wait to knit it again! The Cascade Alpaca Lace yarn I used is a new yarn from Cascade. I love it! 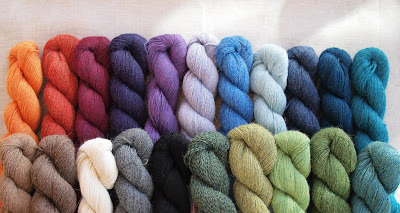 It is so soft and warm and comes in 21 beautiful melange colors! 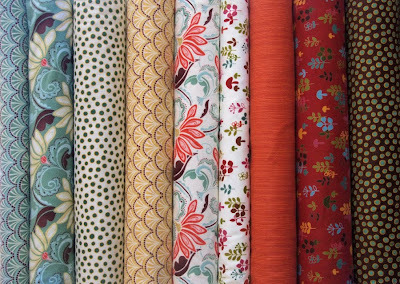 Each colorway is made up of a few hues blended together, resulting in a rich and jewel-like color. So beautiful. Jaime's Fall Knitting: Little Colonnades for all! Fall weather makes my hands itch to be knitting! Crisp cool air get me thinking of wool and alpaca and all of the accessories and cardigans I want to be wearing and making. I started this fall off right by making two quick and easy accessories: the Little Colonnade for myself and my partner, Matthew. 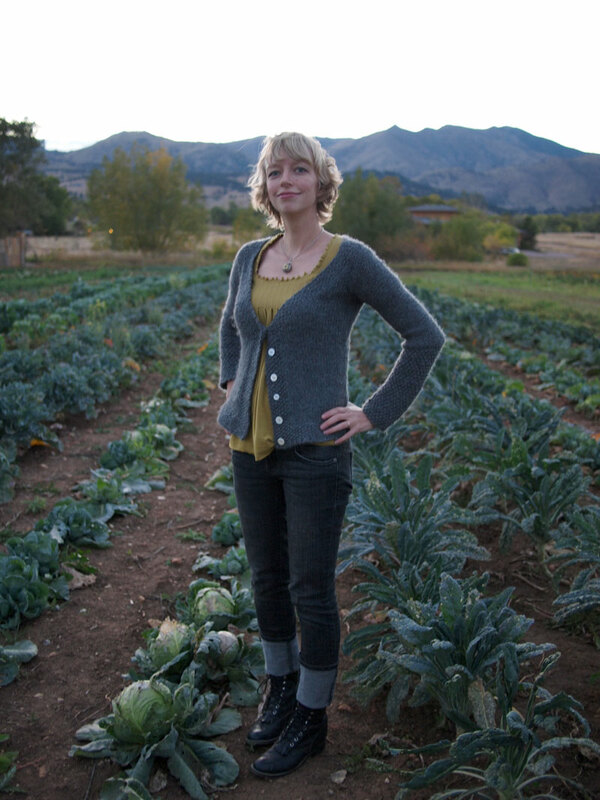 Our CSA harvest party was held on a chilly fall evening up in the foothills so it was the perfect time to debut my newest knitwear. You might be aware that I almost exclusively knit with un-dyed wools and alpacas which are always neutrals and rarely any color. I was really trying to break out and I think I succeeded with the bright pink and purple Zauberball I used for my Little Colonnade. The Little Colonnade is a pattern by Stephen West who also designed our favorite Daybreak pattern. This little shawl features a simple but beautiful lace border. I like my shawls small as I prefer to wear them as neck-wraps, so I left out the last section of lace border for a slightly smaller shawl than the pattern calls for. The best thing about Stephen West's patterns is they are equally hot on men as on women. Matthew was super excited for me to knit one up for him as well, and he picked out a kettle-dyed brown Malabrigo sock yarn. 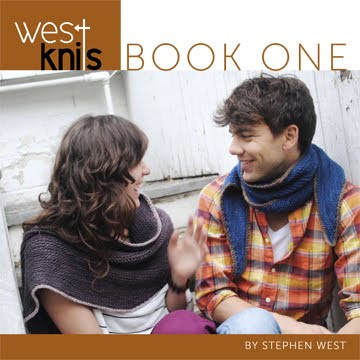 If you are as ready for fall knitting as we are over here at Fancy Tiger Crafts, you will be happy to hear we just received Stephen West's new self-published book. 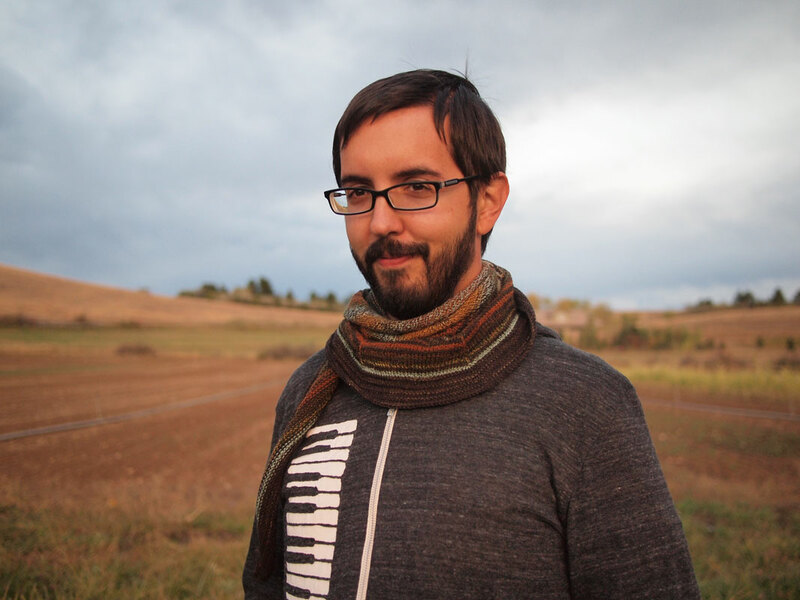 This is his first collection of patterns and we can't wait to knit them all! Westknits Book One features eight new patterns of his original geometric-style accessories for men and women. You can be sure to see some of these featured soon on our blog! 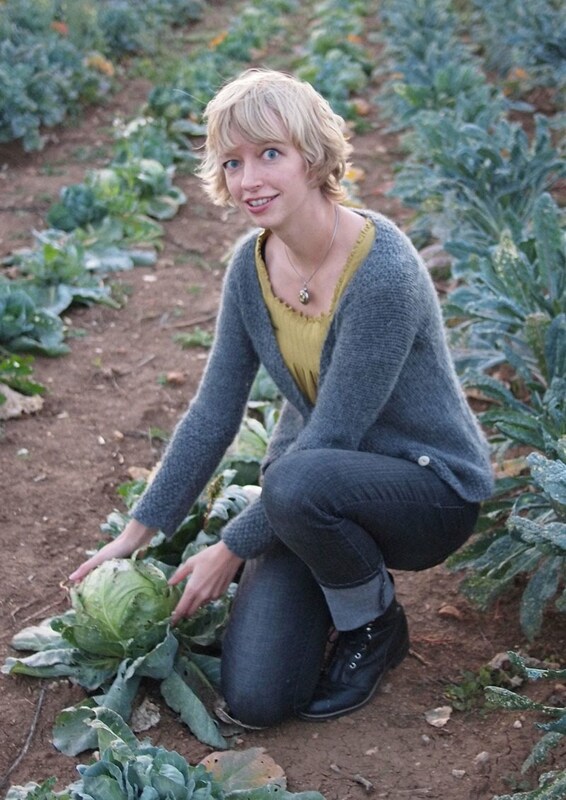 Stay tuned to see what Amber and Emily have been knitting up so far this fall! 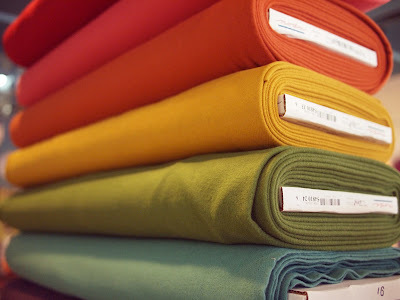 We have loads of the softest flannels in for cozy winter sewing--perfect for pajamas and pillows and soft baby blankets! We're so excited about flannels we are offering them all at a 10% discount this weekend! Cloud 9's 100% organic cotton Forest Friends Flannels are adorable and earth-and-baby-friendly. 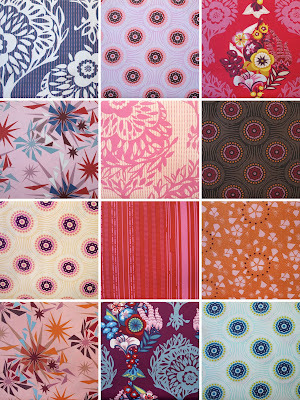 Stop by the shop this weekend to see samples of this new flannel collection sewn up into pillows, clothing and quilts. Moda has a few new collections that feature flannels. We love the sophistication of these prints and imagine pajama pants for the adults in your life. 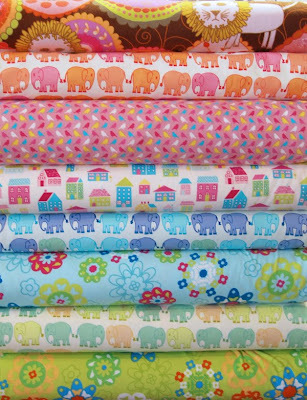 Erin McMorris and Valori Wells, two designers we love, are also making fun flannel prints featuring houses, birds, elephants and lions. Get to holiday crafting with cuddly gifts made out of flannel this season! 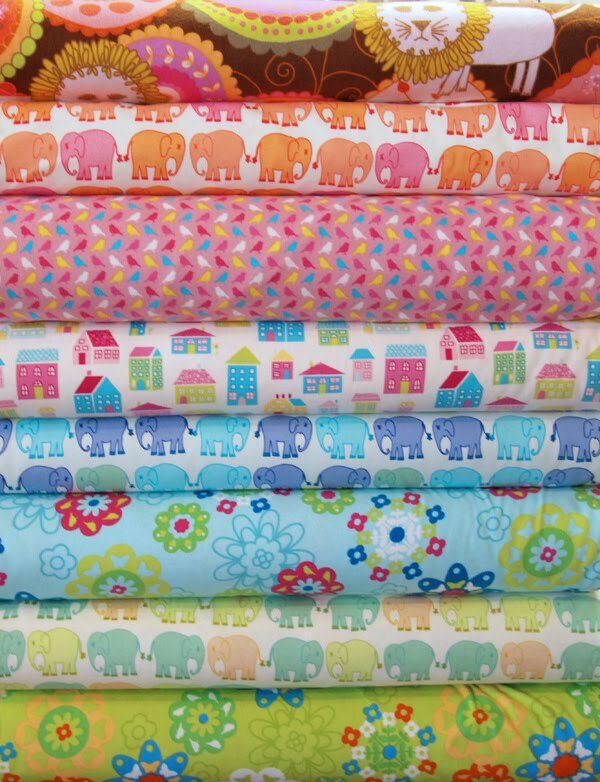 It seems like we have been crafting for so many new babies lately! 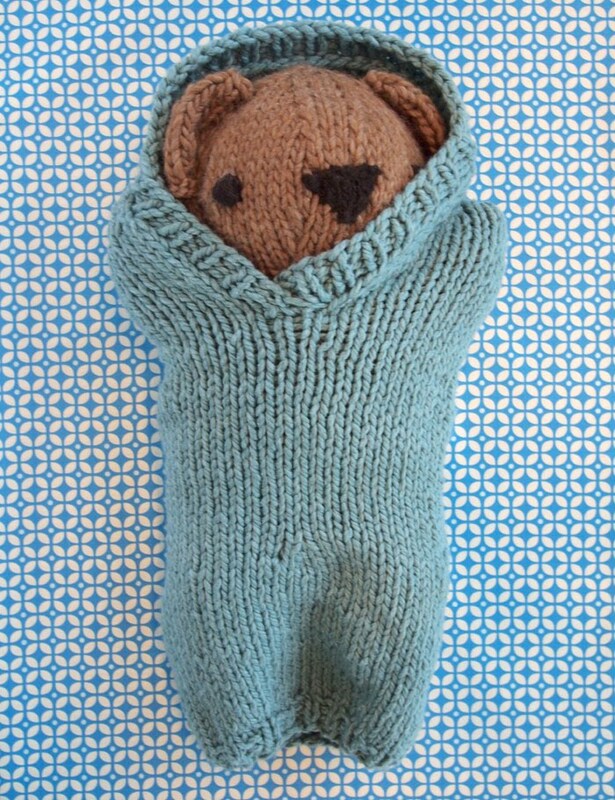 Handmade baby gifts are the best--they are often quick because of their small size so you can really make them extra special. Our quilting instructor here at Fancy Tiger is about to have a new baby boy and since she is an amazing sewer, we had to use our knitting skills to whip up some gifts to welcome the new baby. 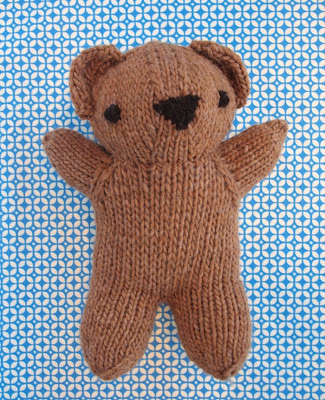 Amber made this larger-than-baby-sized bear! She used the Bobbi Bear pattern from Blue Sky Alpaca and knit it up in the Brown Sheep Burly Spun yarn. This bear is huge and will be the perfect cuddly companion to keep the new baby boy company. I made a bunting using the Spud and Chloe Buga Baby Bunting pattern knit up in the super thick and soft Spud and Chloe Outer yarn. 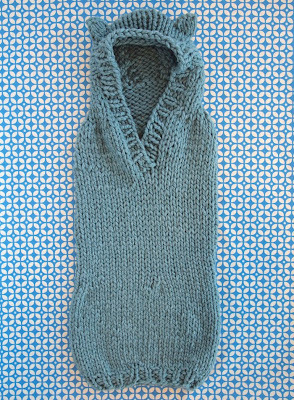 This machine washable, organic cotton/wool blend is oh-so-soft and will keep the new baby cozy and warm this winter. We can hardly wait to see him bundled up in it! Bobbi Bear can hardly wait to go home with the new baby and is keeping the baby bunting nice and warm. 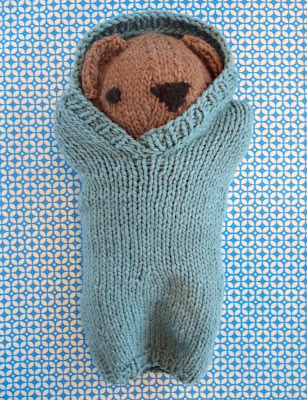 Congratulations Jessica and Ismail and thanks for giving us an excuse to knit up theses cute items! We can't wait to meet the new baby. 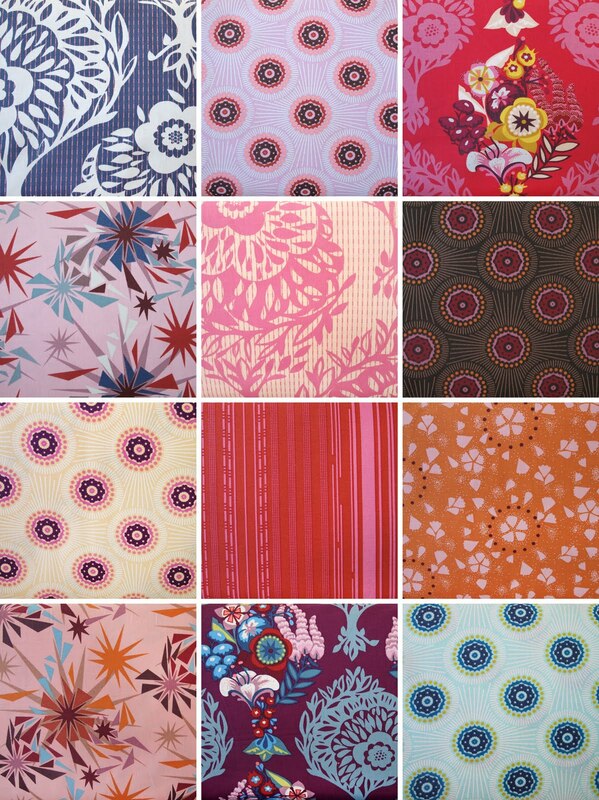 Hot pattern alert! When Cristi visited us recently wearing the Liverpool Tunic I couldn't resist asking her to pose for our blog, even though we featured Sophia in her Liverpool Tunic last week! 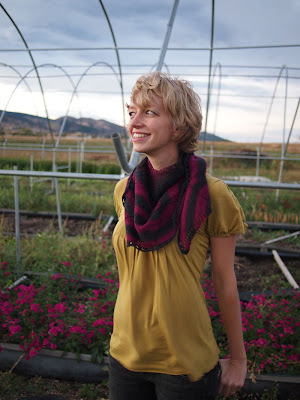 Cristi is a super crafty lady who teaches knitting classes at A Knitted Peace in Littleton. 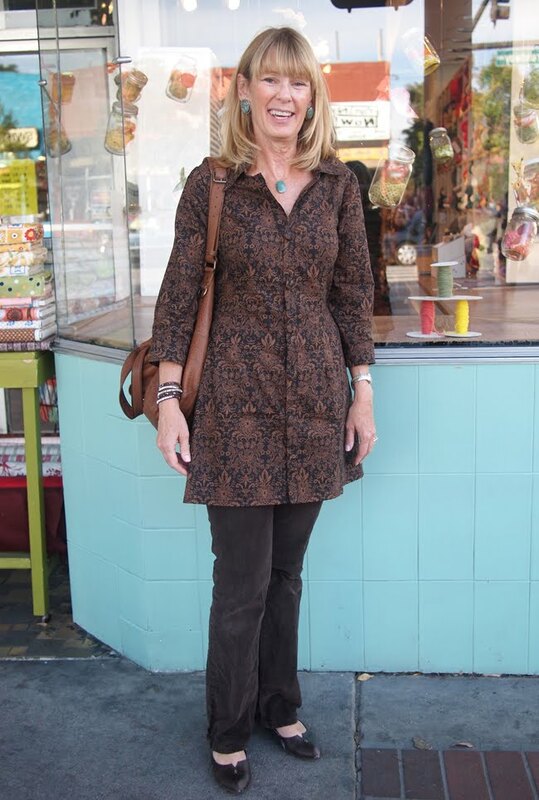 She did a great job stitching this tunic up and the fabric looks lovely on her! 1) What kind of crafts do you do? 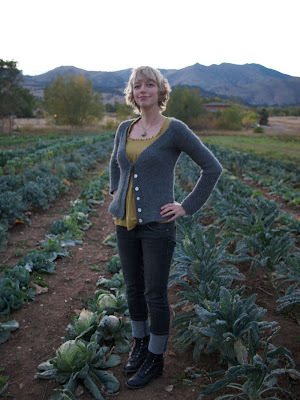 I knit a lot, and design knitting patterns. 2) Tell us about making your tunic. 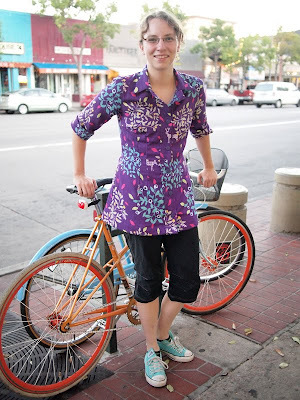 I made the Liverpool Tunic by Amy Butler. I sewed it on my old Elna machine. 3) How did you learn to be so crafty? I learned how to sew by making things for my Barbies. My mom taught me everything. Start by making a felt ball. 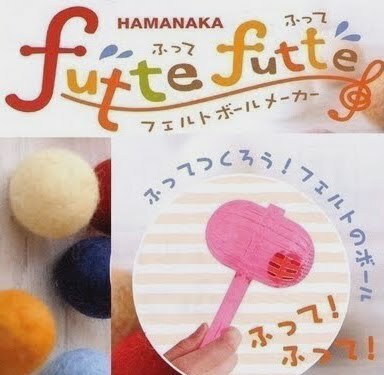 We like to make a bunch of them before the decorating fun begins by using the Japanese Futte Futte wet felt ball maker. 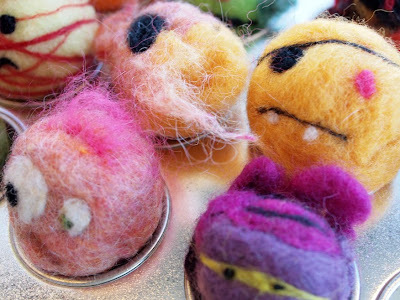 You can also make felt balls by rolling the wool roving between your palms with some warm soapy water, or by needle felting them. You can make them uniform in color or mix a couple of colors together for a crazy monster. If the balls are mis-shapen or have weird wool dreads hanging off of them, that's okay - imperfections just make scarier monsters. Once you have made lots of wool balls the fun can begin. At this point you may want to invite your friends over for a monster making party. Use your felting needle to add tiny bits of contrasting wool for your monster's eyes, mouth, hair, fangs and/or drool. Just place the wool on your monster head and poke it in about a 1/4" to 1/2" deep holding the needle at a 90 degree angle to your monster ball. 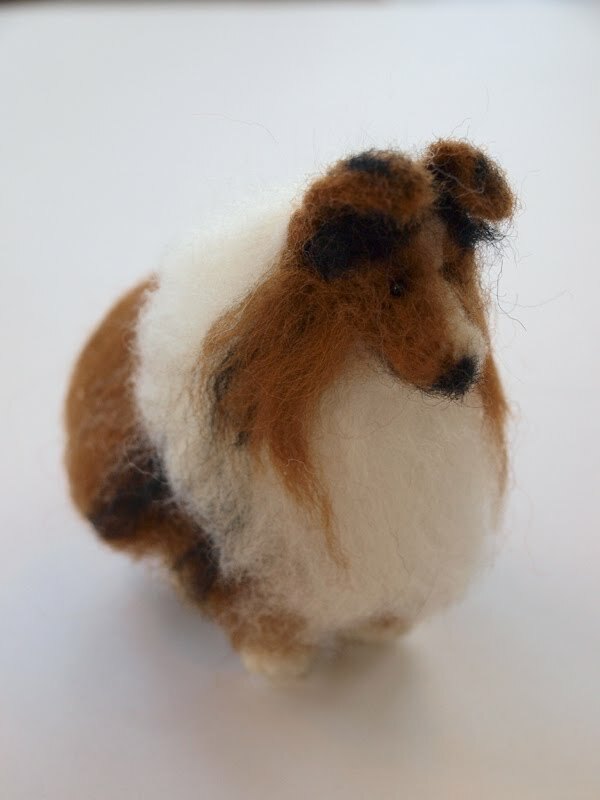 You can roll the roving up into a fuzz ball between your fingers first to bring it together and make it easier to felt. 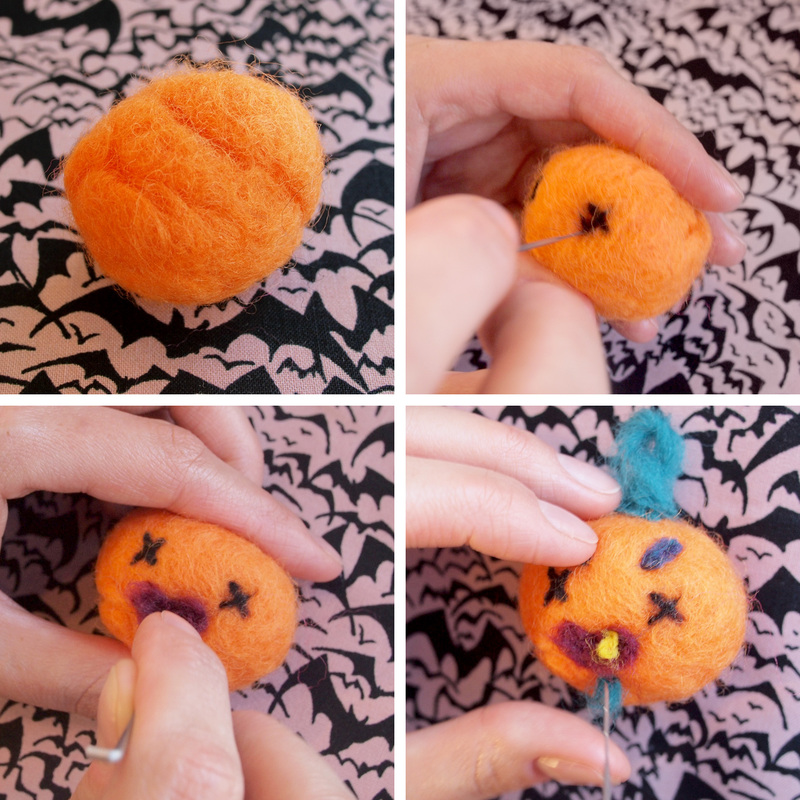 Use the needle to poke and shape your fuzz ball into an open mouth, wacky eye, or tiny tooth. 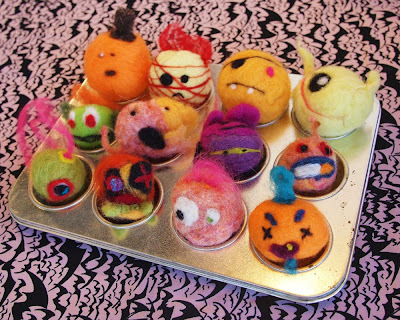 Pin a monster to your lapel, make one for your most ghoulish friend, or put several on sticks and start a monster puppet theater! Wool monster-making is fun for kids and adults alike on a dark, spooky evening. New Anna Maria Horner Innocent Crush! 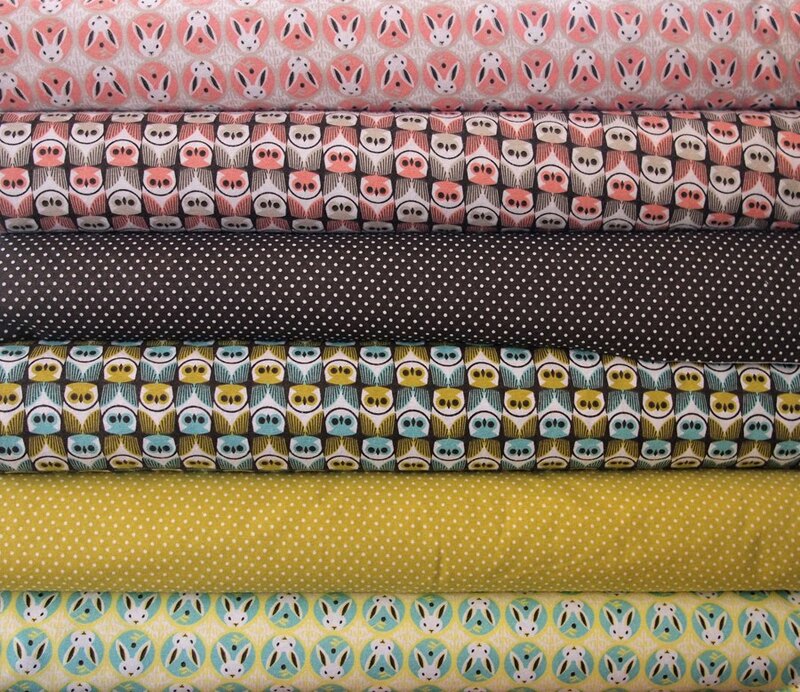 We're crushing on Anna Maria Horner's Innocent Crush fabrics! The quilting cottons are just hitting our shelves. 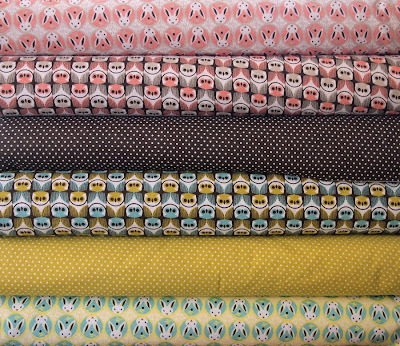 More to come includes home dec fabrics, cotton voiles, and a brand new fabric--cotton velveteens! 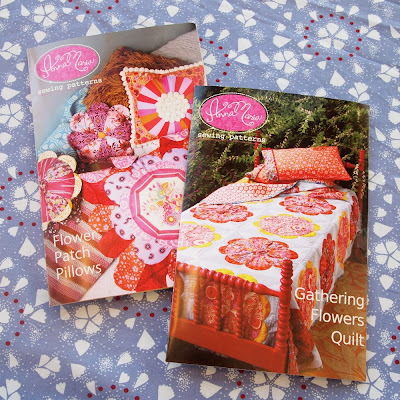 Anna Maria has two new patterns to add to her collection--one a medley of gorgeous throw pillows and another that is the most darling flower patchwork quilt of all time. These new projects are the perfect thing to beautify your home! Sophia is a darling, dear friend and has been crafting with us at our Tuesday night craft night since the early days. She is a whiz at knitting, sewing, embroidery and just about anything crafty that she picks up. Within a few days of each other she finished these two sweet shirts! 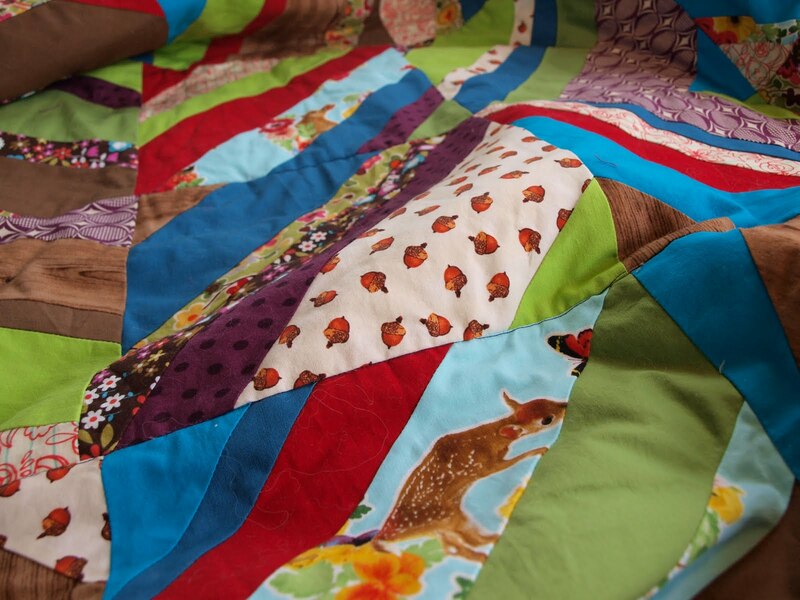 1) What inspires your crafty nature? I work at a thrift store, so there is always something at work to inspire me--from awesome vintage clothing to handmade objects that people have donated. 2) Tell us about the two projects you've made. The first is the Liverpool Tunic pattern by Amy Butler. I made it in an Echino fabric. This tunic took me three days to sew over the course of a few weeks--one day to cut out the pattern and mark the fabric, another to sew up the main panels and collar and a final day to finish. When I bought the pattern I thought the darts would be the hardest part, but they turned out to be the easiest. The sleeves and collar turned out to be the most challenging bits, but after a lot of pinning and sewing and ripping I finally got everything to work. This was my first attempt at sewing a shirt and I am so excited to wear it to work tomorrow! For my embroidered deer shirt I got a simple blouse from the thrift store and used a Sublime Stitching pattern to improve it by 150%! I feel like the two colors keep it simple and quick--this project only took me one craft night! 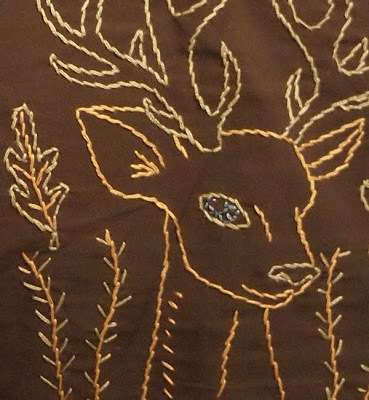 My mom taught me to embroider when I was very small, but I've not worked with it much until recently. My mom is awesome with embroidery, she is always making little gifts for people with it. 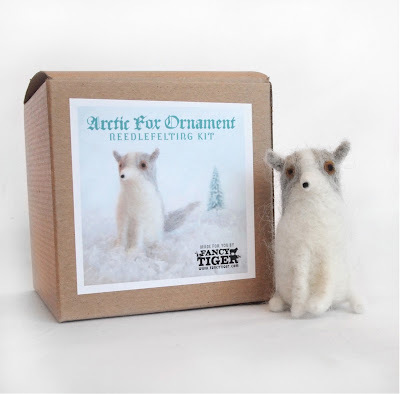 New Fancy Tiger Needlefelting Kits! 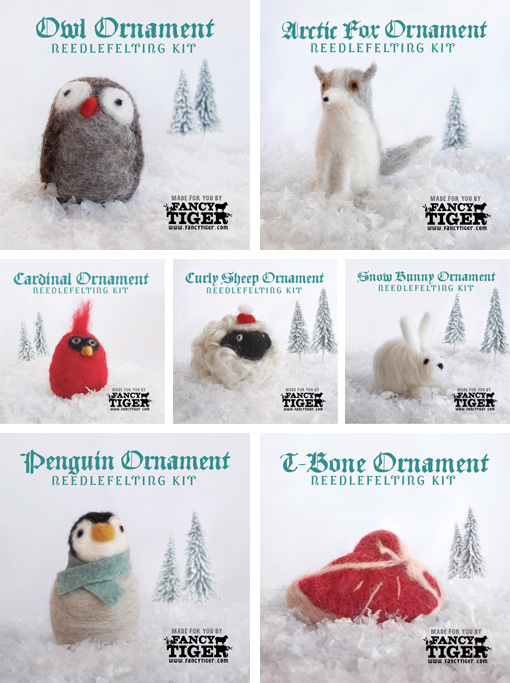 We are excited to unveil some magical new needlefelting kits! Please welcome the newest additions to our needlefelting kit world: White Sheep and Black Sheep, redesigned and featuring real curly Wensleydale locks, and our newest holiday ornament kits, Arctic Fox, Snow Bunny and T-Bone Steak. 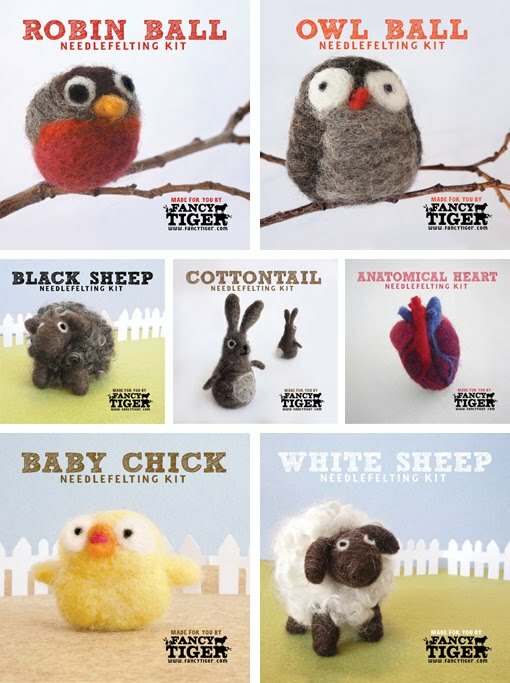 Check out all the Fancy Tiger Needlefelting Kits at Fancy Tiger Crafts or online at our Etsy shop! We took a trip down to Taos this weekend for the Taos Wool Festival, an annual market which features vendors selling locally produced wool and fiber. We were so excited to see so many fiber farms representing the amazing fiber produced in our region! 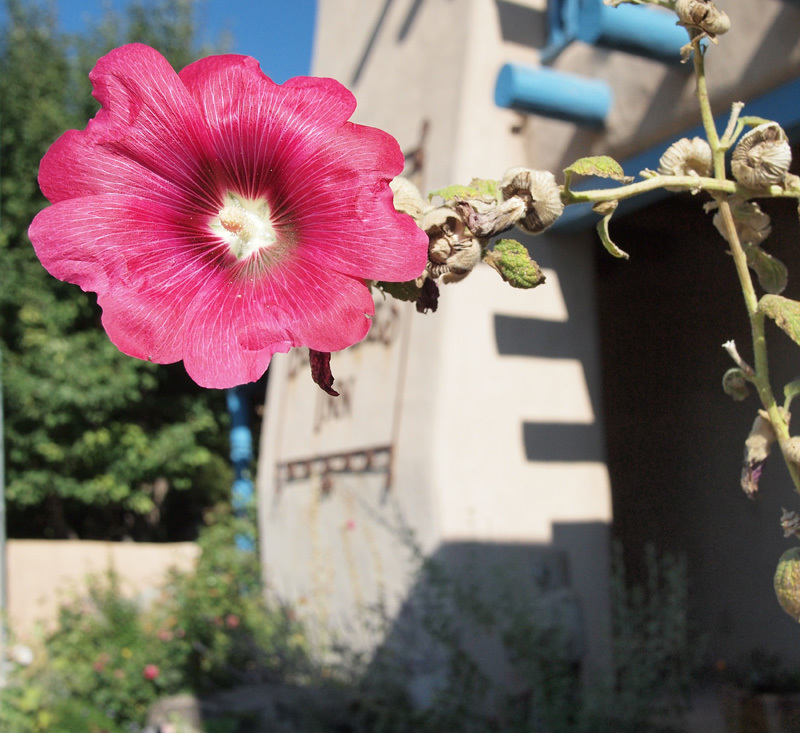 We saw many Colorado folks we know and love--Lonesome Stone Fiber Mill, Elsawool, Bisou Basin Ranch, Woodlake Woolies, Jabberwocky Farms--as well as some of our favorite farms from Texas and New Mexico. 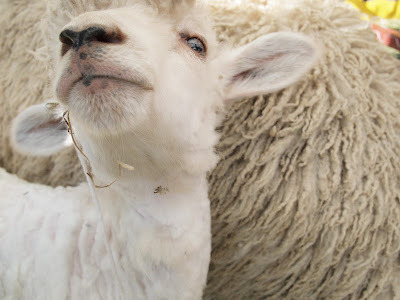 Yarn and fleeces and locks, oh my! It was hard to resist all the luscious, lustrous, woolly goodies. Chase and Emily picked up some lock yarn from La Lana wool, Amber considered taking up weaving to make a rug out some huge skeins of Churro yarn, and Jaime finally decided on some local Cormo yarn from Elsawool. A big part of the festival is fleece judging. Jaime and I scored a prize-winning black Wendsleydale fleece for our new Black Sheep needlefelting kit! We can't wait to share it with you! 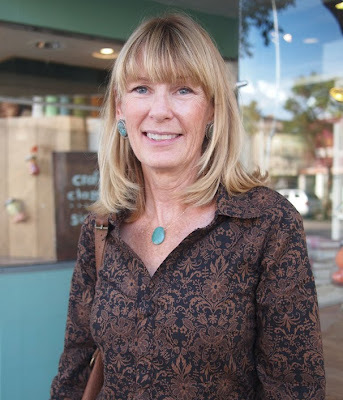 The Weaving Southwest gallery and studio was filled with amazing handwoven art pieces that we all coveted. They were also putting on demonstrations, and we were lucky to catch this one about nuno felting. Nuno felting is a method of wet felting onto a fabric base. 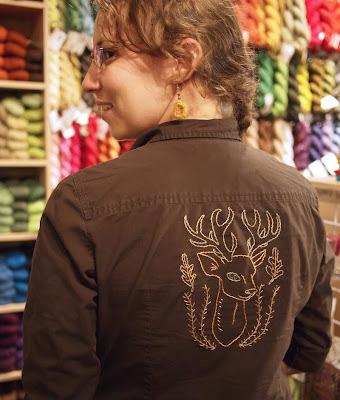 We learned all the ins and outs of this unique fiber art. On the way back to Denver, we stopped off at the amazing Bishop's Castle. This stone and iron structure is located in the beautiful San Isabel National Forest and was built by one man, Jim Bishop. Mr. Bishop has been working on this masterpiece for over 40 years, and it was amazing to explore it and courageously climb it. Yay for fiber trips! We were so inspired to see all of the amazing fleece and yarn and and talk with the farmers from our region. 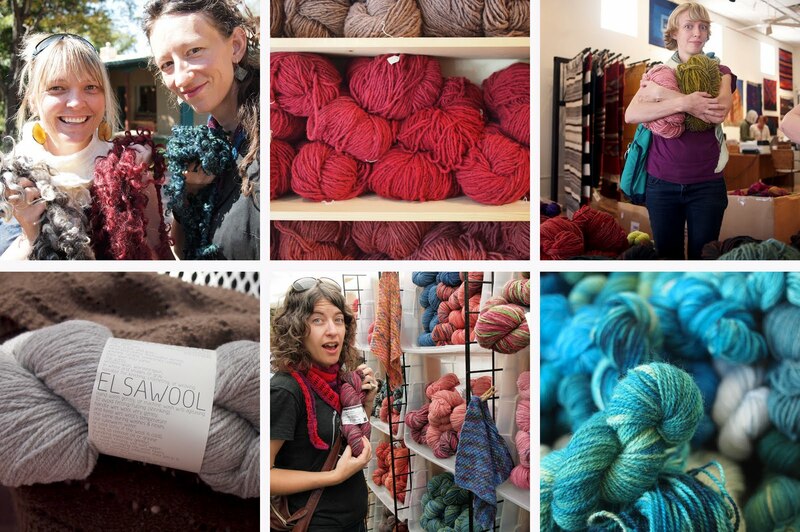 Our roadtrip left us refreshed and inspired to immerse ourselves in wool! We're ready for Fall Sewing! There is a chill in the air that promises fall weather will soon be here! 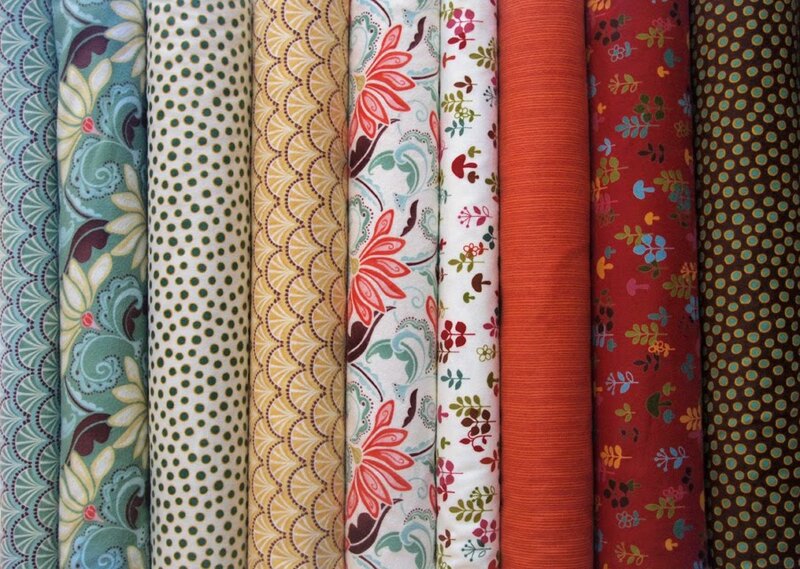 We are ready for cool weather sewing with oh-so-exciting and colorful 100% wool fabrics. This luscious and hearty wool fabric is perfect for jackets, skirts, winter coats and bright accessories. Imagine a wool patchwork scarf in vibrant colors to keep you cozy! 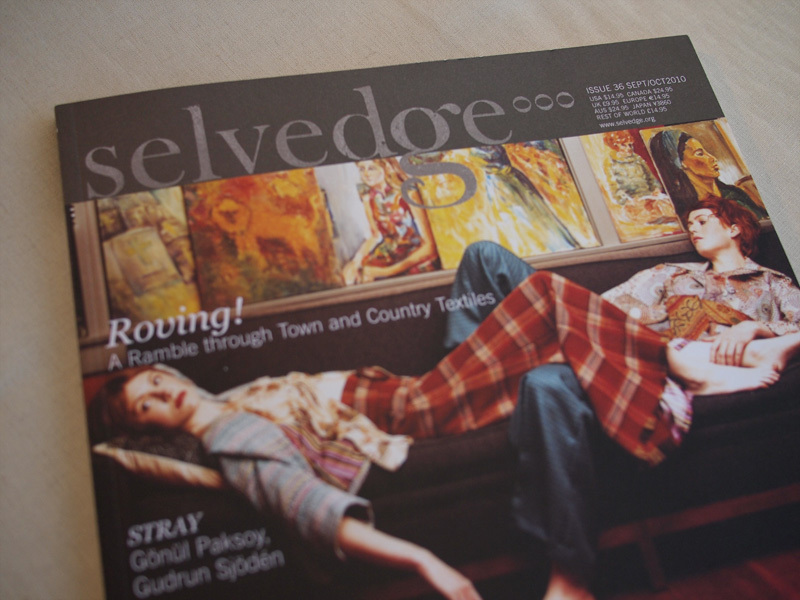 We are also happy to now offer the ever inspiring Selvedge on our magazine rack. We have always loved Selvedge and are so excited that they now have distribution in the US. If you have not seen this magazine you should stop by to check it out! 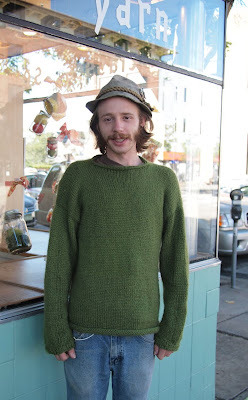 Nick knitted his very first sweater! 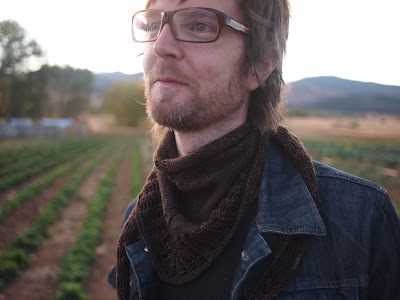 We are amazed because he took on this project from a calculate-it-yourself pattern in a book he found in the library, Knitting in the Old Way. Nice work, Nick! I blow glass, knit, draw, do needlepoint, torchwork and metalwork--just need stuff to do. Tell us about the sweater you made. This is my first sweater. I knitted it. I read a book, made a swatch and tried. I knitted it on a 10.5 needle and used Cascade Baby Alpaca yarn. A lady friend taught me one summer. A hippo or a Yeti. Thanks Nick! Yetis are awesome. Happy crafting!